I am a big lover of potatoes and french-fries, I can literally never get enough. I like them almost any way and I love finding new ways to cook them. 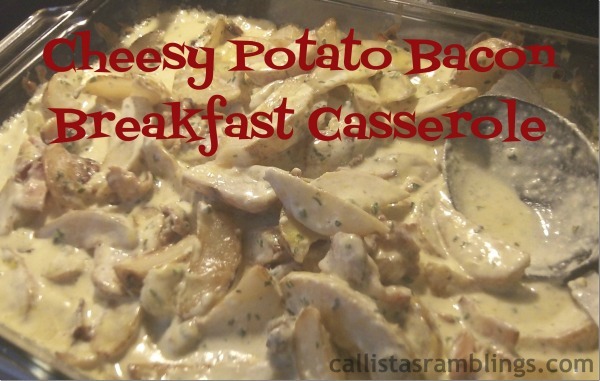 This recipe for Cheesy Potato Bacon Breakfast Casserole is from the Cavendish website and uses one of their new potato products in the From the Farm line. 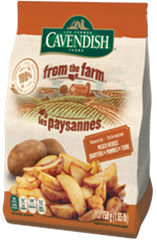 Cavendish From the Farm products include wedges, rustic reds and straight cuts and are exclusively from Prince Edward Island (PEI), Canada. The skin is left on unlike many frozen potato products (and the skin is very good for you) and they are prepared with 100% Canola oil and lightly seasoned with sea salt. Cavendish From the Farm products are low in saturated fat as well. I looked through the recipe ideas and decided on a breakfast dish but we had it for dinner. I love making breakfast for dinner, we do it at least once or twice a month. 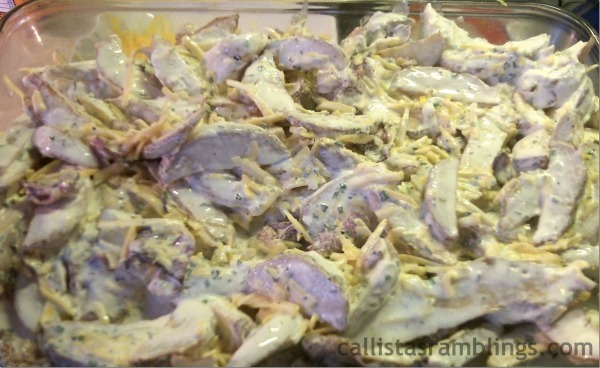 If you look at the photo from the recipe page, you’ll notice mine doesn’t look quite the same. I doubled the recipe and it ended up a big watery but still tasted SO very good. I also added more cheese than it called for because we are cheese lovers and I used dried chives and parsley instead of fresh parsley and green onions. I also omitted the mushrooms. When I cook, I like to be creative and cook without recipes. If I do use a recipe I never use it exactly as is. You will also need a baking dish, frying pan, mixing bowl and spoon or spatula. Oh and you might want to print the full recipe from the Cavendish website. Although it’s really easy. 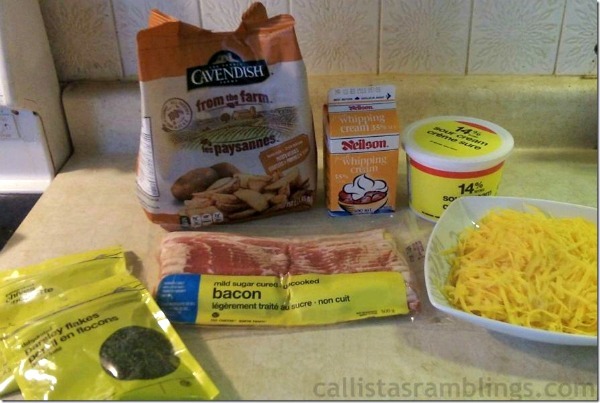 Cook the bacon, mix everything together and bake. You can’t go wrong with such an easy recipe and it was super filling too! I just paired it with scrambled eggs and some toast. I also tried the Cavendish From the Farm Rustic Reds but decided to make it all up myself this time. I wasn’t able to get good photos of it but I just cooked up lots of onion and chicken and bacon and threw it together with the rustic red potatoes and the made my own cream sauce with flour, butter and milk. I added seasoned salt, black pepper and tarragon and poured it over and then baked. I was making it for someone who doesn’t like cheese so we sprinkled cheese on top, otherwise I would have added the cheese to the cream sauce. See how easy it is to make something up? 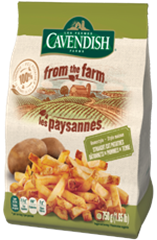 If you are looking for a more healthful and rustic alternative to french fries, you may want to consider Cavendish From the Farm. If you are on a budget though, you will have to see if you can fit them in. *Disclosure – I am participating in the From the Farm blog tour by Mom Central Canada on behalf of Cavendish. I received compensation as a thank you for participating and for sharing my honest opinion. The opinions on this blog are my own. See my Disclosure Policy for more information.